Carsten Milsmann, WVU Assistant Professor of Chemistry, in his lab in Clark Hall. 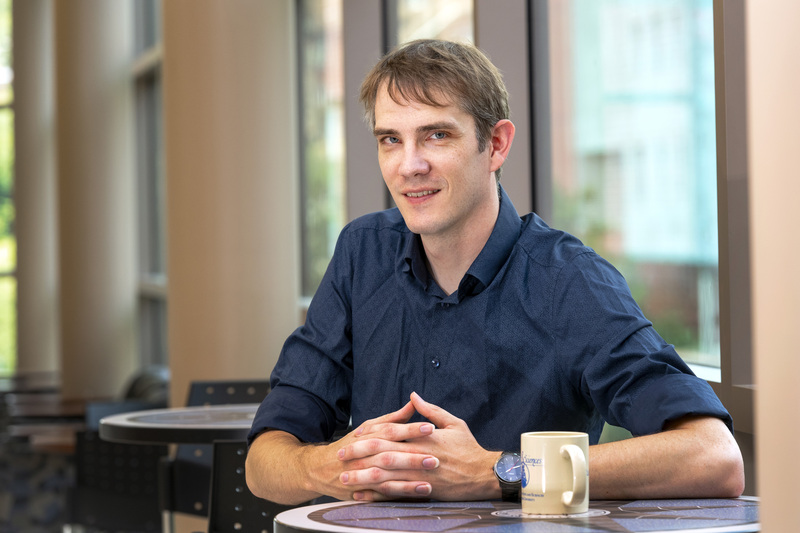 Carsten Milsmann, assistant professor in the C. Eugene Bennett Department of Chemistry at West Virginia University, has earned the National Science Foundation’s prestigious CAREER Award for research that could help develop solar energy applications that are more efficient and cheaper to produce. “In general, we are interested in so-called photosensitizers because these molecules can absorb light and convert it into chemical energy,” Milsmann said. Milsmann, alongside five WVU graduate students, hopes to develop new compounds using early transition metals. These are more widely available and cost effective than the precious metals typically used in new solar cell technology, which has been held back by these pricy materials. Iridium and ruthenium, for example, are far more expensive and rarer than platinum. However, there are significant obstacles to replacing the precious metals in solar cells with more widely available (or “earth-abundant”) elements, related to their unique chemical properties and their location on the periodic table. From this research Milsmann anticipates working in the field of artificial photosynthesis, which he describes as harvesting sunlight and transforming it into fuel. The NSF’s Faculty Early Career Development, or CAREER, Award recognizes promising and talented early-career faculty who have the potential to serve as academic role models in research and education. The award comes with nearly $650,000 in funding over a five-year period.